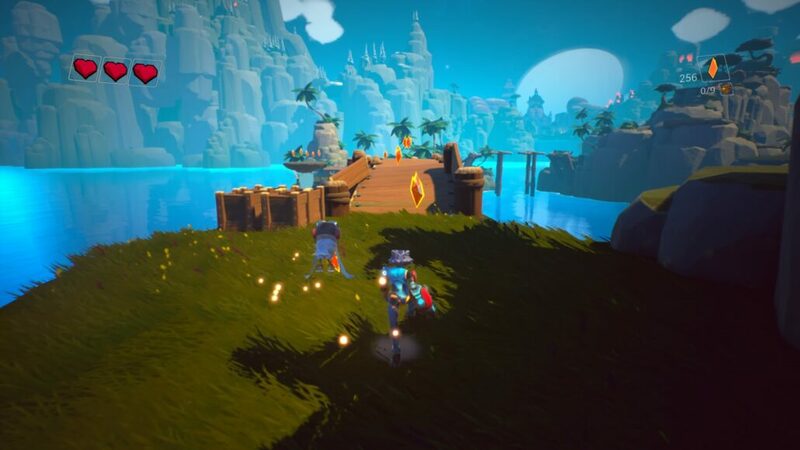 While Yooka-Laylee was a bright, colorful and mildly disappointing spiritual successor to Banjo-Kazooie, Skylar and Plux: Adventure of Clover Island feels a like a descendant of Crash Bandicoot. 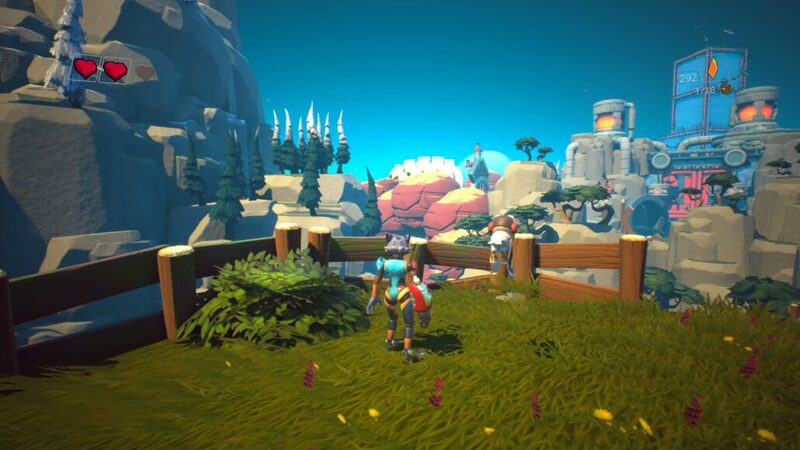 Running, spinning and jumping across a cheerful tropical island, Skylar and Plux has all the hallmarks of a family friendly platformer, complete with cartoonish graphics and an annoying sidekick. Although your initial exposure to the game, beyond its annoyingly long and generic title, is a claustrophobic and stuffy affair on a cramped and dull metal spaceship, once you find yourself planet side, the world is a joy to behold. Everything from the sandy beaches to the wooden bridge boards looks stunning. The color palette is vibrant and the attention to detail self-evident, each level reveal looks postcard-worthy and the developers are clearly proud to show off their work. Unfortunately, the same cannot be said for the sound design. Whether it was a bug that can be patched away or an oversight by the team behind the game, the dialogue in particular has some deep issues. When you arrive on the island, you are introduced to Plux, the aforementioned sidekick. After a brief introductory cutscene, you hear some startlingly peculiar conversation. I replayed this moment twice and had the same result: Plux’s voice suddenly heightens like his recording has been sped up, while lines of dialogue are repeated ad nausea until it all abruptly ends. It’s such a shame for this to happen at the same moment you’re introduced to the beautiful scenery, and although it was by far the worst, it wasn’t the only dialogue hiccup I encountered. The voice acting isn’t stellar either. I don’t want to dismiss it out of hand as a tiny studio having voiced characters is still quite an accomplishment even nowadays, but the actors could do with a little more practice on their voicework. The characters behind the dialogue are pleasant enough, but the title feels somewhat misleading. 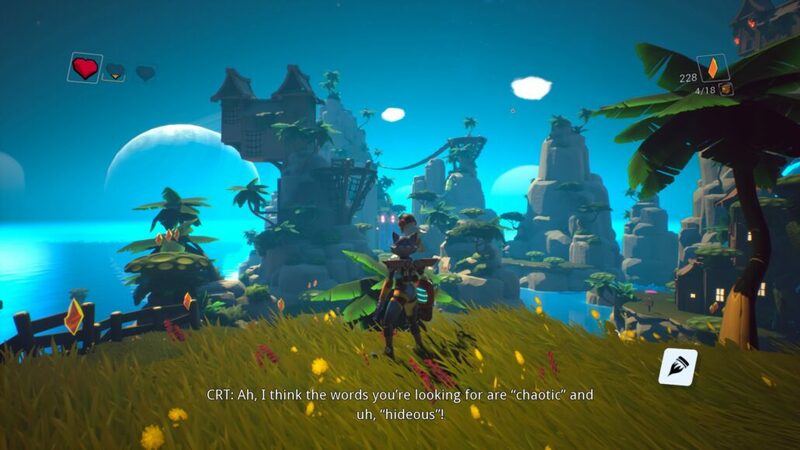 While the game suggests that Skylar and Plux are alone at the center of the action, there actually is another voice that proves critical throughout the story: Skylar’s arm. That’s right, the girl lady’s robotic arm is sentient, and of tremendous importance to progressing the story. With the remaster of Crash Bandicoot not yet released, I cannot remember how nonsensical the story was. It had something to do with an evil scientist and possibly traveling back in time, but regardless of that, Skylar and Plux has a story so derivative it almost hurts. It covers all the hallmarks that you wish weren’t so familiar: There’s an evil corporation being evil for some reason, there are the plucky heroes have against the odds for the indigenous life, there’s amnesia, an unfunny sidekick and so much more. You’ll catch glimpses of inspiration from other games, like the villains’ tendency to wisecrack at the heroes in much the same way as Handsome Jack (albeit, with the swearing or dirty humor to make it interesting), but none of it helps the narrative elevate much beyond an excuse to keep playing. Luckily for the game and the player, the gameplay can hold its own. Also, being so clearly targeted at children, there isn’t as great a need for a coherent or competent story. Playing as Skylar you get a few abilities pretty much straight away, all familiar to the typical the children’s action adventure. You can spin attack with means you don’t have to worry about accuracy, and you can swing from stationary robotic prompts that get you across the larger gaps that double jumping cannot cross. Early on you’ll even be given a jetpack to further distance your jumps and open up the fairly linear map. There are a bunch of collectibles scattered around the island too, trapped residents of the island that have to be found and freed with a simple respawning currency. Most are hidden just off the beaten track, normally on an obscured ledge or behind a bush, but some require a little more exploration. But there isn’t much more to explore outside the occasion open area with a few hidden passageways. The game isn’t huge, with three distinct areas outside to the small hub zone. You’ll climb a lonely mountain, explore a stretching desert and sneak into a massive corporate office. Each has its own unique style, but the gameplay doesn’t change up between them, however nice they are to look at. Skylar and Flux is an interesting beginning. Obviously inspired by some popular video games from the 90s, it has a pretty foundation to build upon. The gameplay is fun, if a little basic, and the excellent visuals certainly do make it much easier to keep playing. Although it can be finished in a couple of hours, it’ll certainly keep a child or two distracted for the weekend, without any taxing puzzles or tricky exploration, it’s a solid game for beginners. Unfortunately, it lacks the depth or pure nostalgic hype to really appeal to the wider gaming audience. Lacking some polish in the audio and with a highly derivative story, it's hard for Skylar and Plux to stand out from the crowd. Its visuals are nice, however, and gameplay is solid and enjoyable enough. Children will love the vivid colors and silly characters, but not enough is done to appeal to the mainstream gaming crowd.